Driven by the newly elevated crown prince Mohammed bin Salman, Saudi Arabia is undergoing unprecedented social changes. The whole of Saudi society is moving towards a more progressive mindset. This modernism is being reflected in how they engage with each other and the rest of the world over social media and the internet. 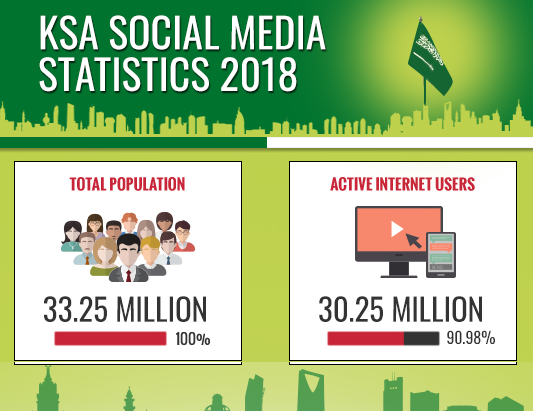 Reflecting on last year’s social media statistics reveals that the number of internet users in Saudi Arabia rose swiftly to touch 30 million people by the beginning of 2018. The internet penetration in the country has now reached 91%. Social media is beginning to play an important role in lives of Saudi Arabians and its usage has expanded rapidly. From just being networking platform, social media has morphed into a potent force for social change in Saudi society. The Saudi government has also been effective in utilising social media to engage with citizens and to gauge public consciousness. Key members of the Saudi royalty have been taking to their Twitter and Facebook accounts to drive for reforms across the Kingdom. Members of the ruling government like Abdlaziz Khoja, Minister of Culture and Information and Tawfiq al-Rabiah, Minister of Commerce and Industry use their accounts to disseminate information about government policies and initiatives. One of the major driving forces behind this jump in social media usage is the country’s high rate of smartphone ownership. 84% of Saudi nationals live in cities, where the adoption of mobile technologies has been much faster than the rest of the nation. Cities also offer easy availability of superfast internet connections. The average mobile internet connection speed in the Kingdom has almost doubled in the last year. Out of nearly 25 million total active users on social media, 18 million access these platforms through their mobile devices. This number accounts for nearly 72% of all social media users in the country. In 2018, YouTube upstaged long-time leader Facebook to become the most popular social media platform in Saudi Arabia. 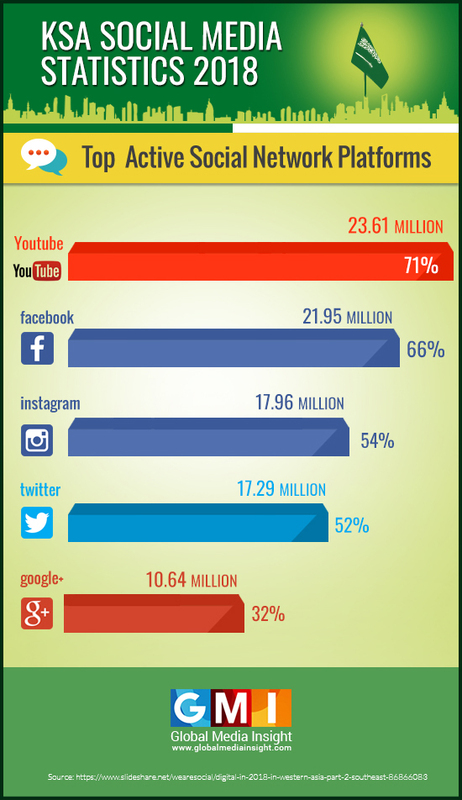 YouTube boasts 23.62 million active users, while Facebook comes in second with 21.95 million users. Instagram is third with 17.96 million users and Twitter fourth with 17.29 million users. The country leads the MENA region for Twitter adoption. With 10.64 million users, Google+ was the fifth most popular social media platform. Family vlogger MrMrSnB2 is the most popular YouTube channel in Saudi Arabia. The channel, that focuses on funny videos featuring an Arab family, boasts nearly 5 million subscribers. Facebook posts in Saudi Arabia (KSA) were dominated by pictures, with nearly 70% of the posts being image posts. Video accounted for 18% of the posts on Facebook and the rest were links or status updates. According to Social Bakers, Religious scholar Mohamad al-Arefe is the most followed Saudi-based page on Facebook while Religious Education TV channel Khawatir is second on the list. Messaging platforms have kept up their phenomenal growth in Saudi Arabia. Predictably, it was WhatsApp, which emerged as the most used chat platform with 24.27 million users. 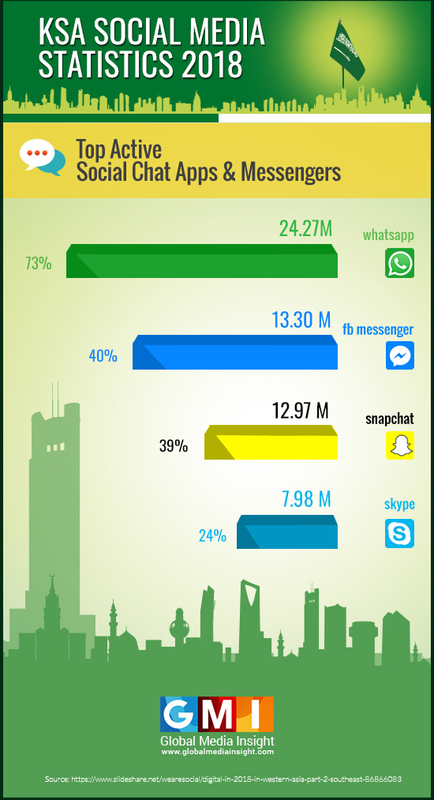 WhatsApp’s market presence in KSA has now expanded to 73%. Facebook’s Messenger emerged a distant second in chat applications. The Messenger has 13.30 million users in Saudi, adding one million users during 2017. Snapchat was the third most popular chat app with 12.97 million users, but showed faster growth than FB Messenger. Skype was fourth in the list with just under 8 million users. Even though a major part of the Saudi population are active social media users, there is a big chunk that is still not connected to any social media platform. This gap is expected to close in the coming years, especially with the swift internet penetration in rural Saudi Arabia. This means that there is still a lot of potential for social media platforms, channels, and users in the Kingdom. Unlike other places in the world, social platforms have served to enhance family and religious values of Saudi society while opening up Saudi minds to new ideas and concepts. The embracing of new technologies while upholding traditional Saudi values was highlighted when the Kingdom granted citizenship to a robot. In October 2017, Sophia became the first robot in the world to be a citizen of any country. Change has spread to several other sectors as well. New policies now allow women to drive cars and they are also being motivated to play a wider role in society. Saudi society is becoming more accepting of new ideas and getting more inclusive in its outlook. In the coming years, social media channels are sure to play a big role in the country’s march towards modernity and social transformation. If you are looking to connect better with your clients in Saudi Arabia or abroad, through the powerful means of social media platforms, we, at Global Media Insight are ready to help you out. Over 17 years of experience in digital technologies and social and digital markets has equipped us with the expertise to drive engagement to increase your business’s reachability and connections. Get in touch with us to discover powerful and successful social media strategies across platforms and channels. Disclaimer: GMI acknowledges that though we try to report accurately, we cannot verify the absolute facts of everything that has been represented on this infographic. The information represented is based on information researched from various sources on the internet. We are not liable for any errors, financial loss, or damages of any kind that may result from the use of, or reliance on, the information herein.